Keeping a record of your spiritual reading. Keeping detailed information about the reading, the date, the reference or passage read. The source of the reading. Recording any plan of action or change that is to result from the above, holding ourselves personally accountable. 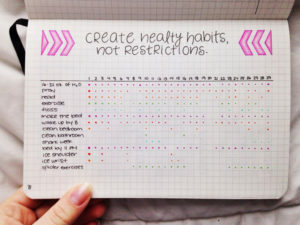 How often would I journal? Quite simply, as often as you are engaging in your relationship with God. 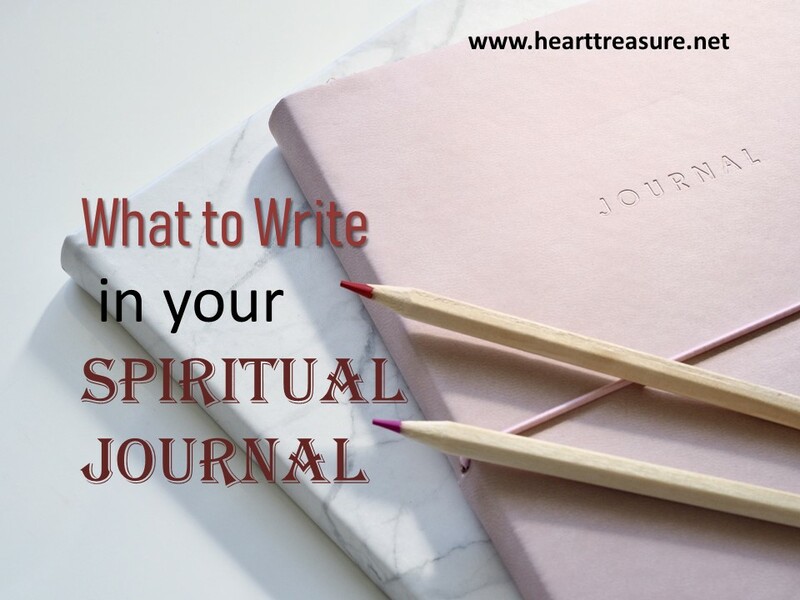 The journal is recording your spiritual journey or walk with God. 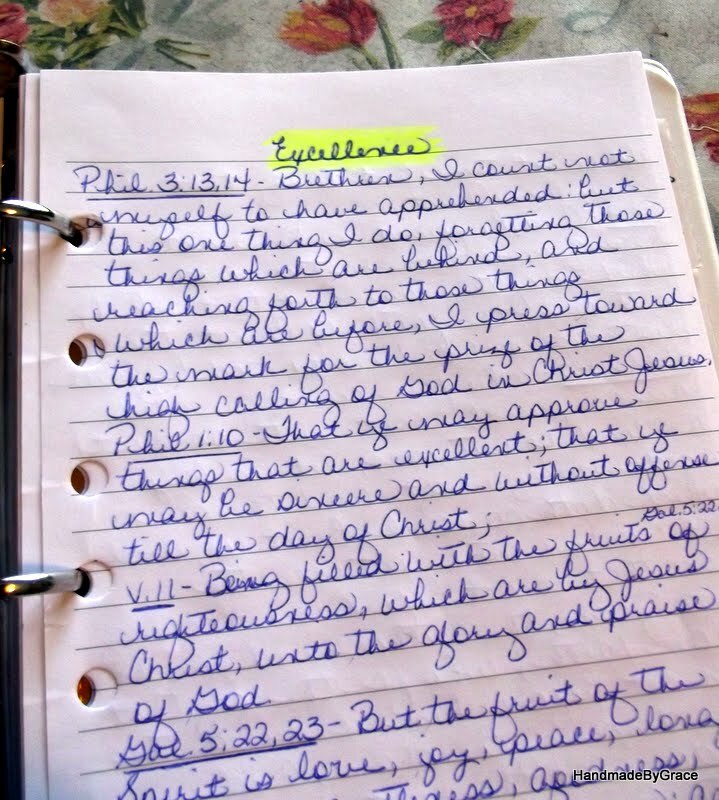 We do not forget good memories or life changing conversations, journaling helps us to record the conversation we are having with God as we listen to HIS WORDS and record what we understand from Him. Then we also record our response to this conversation (it is a two-way thing). 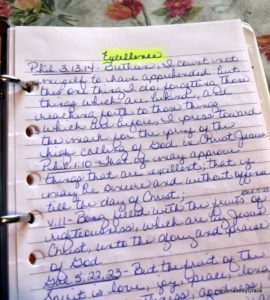 Besides the above, I will often make a list of things I observe in a scripture passage that I am reading. A word, phrase or verse that is making an impression on me. Or any other detail I think is important to record. 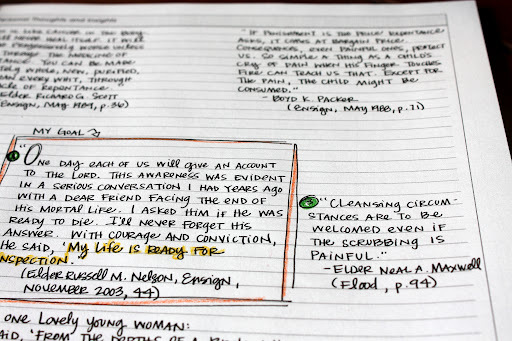 Taking note of scripture verses that keep coming up is part of the conversation process. Write out prayer, both for the purposes of record keeping and I find, it helps me to focus while I am praying. There is something really special about going through prayers and writing “answered” next to them. If this is all you write, that is ok. It has recorded today’s conversation. If you start with the attitude that God is always speaking to you, through every channel available to Him, (be it another person, nature, scripture, music, books, movies, SMS’s, color, insects, sunsets, events, conversations etc.) 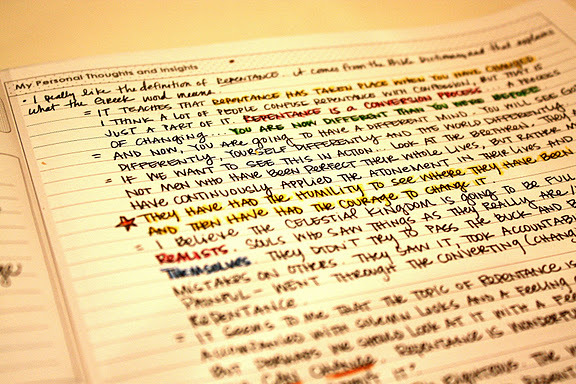 start by recording what makes an impression on you, or is new knowledge to you. 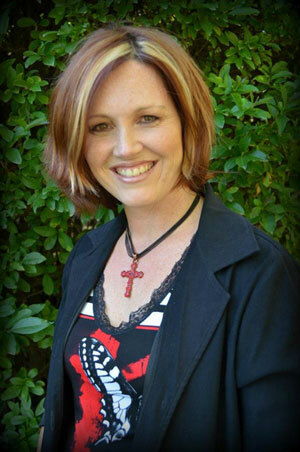 God can speak to you in any way – the point is to record the discussion while it is happening. Don’t worry about relevance, rather focus on what makes an impression on your spirit. 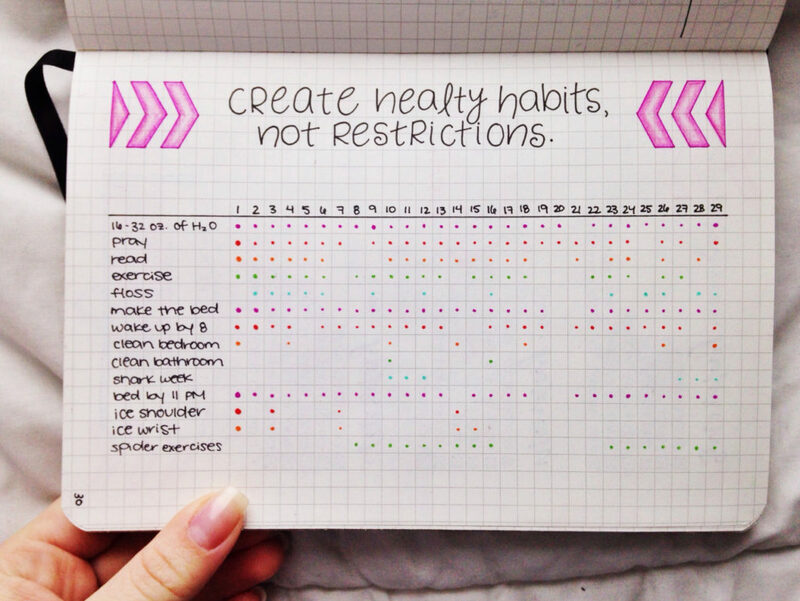 Write down observations about on your life and your behavior, not just feelings. Your own, as well as the observations of others. Here writing down things that you want clarity or healing on, is also relevant. Sometimes this is like taking an honest look at yourself, with God’s help. 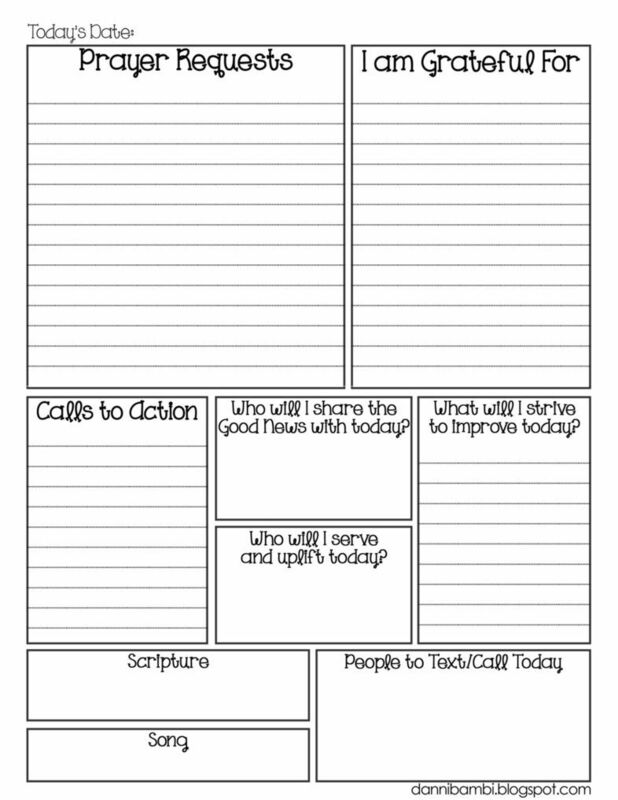 Write down main ideas in conversations you have had, books you have read, sermons you listened to, scripture that you have studied, etc. Record scripture or sayings specifically given to you by a person, a SMS that really speaks to your heart, a prophetic word etc. 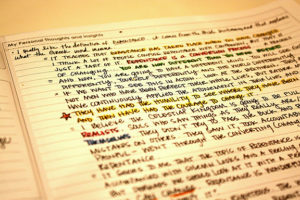 Write summaries for yourself, list things. I am a big fan of making a list to answer a question. Like: “List three things God has been saying to me lately” or “List five things I have learnt in my spiritual walk in the last month’” or “List ten things I know for sure about God. Sometimes I write letters to God, to express myself. But what has also been a challenge, has been, to write what God would tell me in a letter right now. When we are engaging in our quiet time, it is important to remember that the Holy Spirit is inside of us and is very much a part of the process of spending time in God’s presence. He is more than capable of guiding our thoughts and meditations, pointing things out to us in scripture, revealing fresh understanding and relating it to our current life and situations. What is more, He will bring into remembrance things we have forgotten, or things we need to be reminded of. Thank you, Lord, for giving me your Spirit and being with me to teach me and guide me in Your truth. Thank you that I can know that the moment I set aside time to seek You out, You will come and meet me and guide me in the path I should take for life. Help me to be disciplined in coming into Your presence on a regular basis and to pay attention to the conversation that we are having. Thank you, that Your work in me is never finished and that You continue until the day I will see You face-to-face. Thanks so much Michelle. It’s quite amazing to be able to share in your wise words from the other side of the world!